Tomorrow morning the Fourth of July will once again be celebrated by thousands as they make their way down Peachtree to the finish line at Piedmont Park in Atlanta. 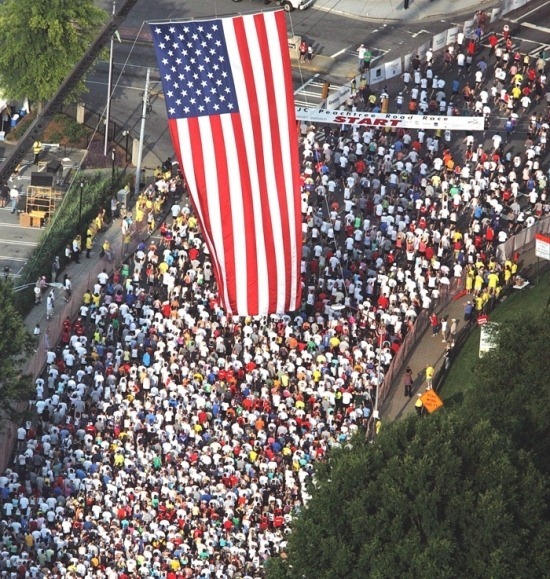 The Peachtree Road Race is an Atlanta tradition which will be enjoyed by 60,000 runners and walkers this year, each with their own unique reasons for running the worlds largest 10k, and each coming away with their own unique stories and experiences. I ran my first Peachtree Road Race in 2007, and have participated each year since making tomorrow my 5th year. I did however finish quite a bit slower in the 2008 event due to a running accident resulting in a broken collar bone just a couple weeks before race day. The run down Peachtree in 2009 was quite uneventful, while last year was quite exciting as I ran the Peachtree for the first time with my daughter Payton (at least the first 4 miles). This year will be another first as my oldest daughter Ashlee tries the 10k racing distance on for size. She has run the distance and more many times, but never in a race. She is a bit nervous since she has not been putting the miles in lately and the 10k distance may be a bit of a challenge. This doesn’t bother me since I have been struggling with getting my groove back since my last injury in the spring and will not be running a pace like I have in years past. This will give us the opportunity to run this race together much like Payton and I did last year. Tomorrow morning Payton, Ashlee, and I will be lining up in Start Wave A knowing full well that Ashlee and I will probably not pull out another “A” qualification in tomorrow’s race for next year. We will need to work on our fitness and find another race to use as a qualifier before registration next March. I mentioned that everyone has their own unique reasons for running the Peachtree. Whether it is that first and only time, or each year as they add yet another notch in their figurative Peachtree Road Race belt, they have a reason why they run it. I run the Peachtree for a few different reasons. I won’t go into all of the reasons, but will take a moment to mention why I ran the Peachtree the first time. If you have been a reader for a while or have taken the time to read earlier posts, you already know about my weight loss of 90lbs in 2007. The part I don’t remember ever mentioning before was the Peachtree challenge that took place a few years earlier. A co-worker and I were having a conversation about losing some weight and made a friendly wager. I don’t remember all the details, but my part of the deal was that I would lose some weight and run the Peachtree Road Race that next year, to which I received some chuckles considering my obvious neglect for anything fitness related. I didn’t fulfill my end of the deal, but luckily he moved on in his career before having the opportunity to call me on my failure. Like many other things in my years of running that never seem to go away, my desire to run the Peachtree stuck with me until 2007 when I accomplished that goal while in the middle of my lifestyle change. I continue to run it year after year, but for more than just this one reason. Although many people despise the Peachtree, it still has it’s draw and glamour in my eyes despite the issues that come up with races as they grow this large. Do you have a story about why you run the Peachtree Road Race? What about any other races that you run, are their stories behind why you began running them or continue year after year? Happy Fourth, Tim! Have a great race! Hi Tim! I'll be in Wave A (front of the group, Lenox side) in the nightlife yellow Brooks uniform and GU visor with my friend Natalie. Maybe we will see you there! Hope you have a great race! My husband and I started running the Peachtree in 1996. I have missed only one of the intervening years (DH has not missed any). I started running early in 1996 as a way to relieve some stress and the ridiculous goal of completing a 10K seemed like a good way to seal the deal and we have never looked back. Love this race! Hey Stephanie - I saw some people with the yellow Brooks uniforms on, and it was very possible one of them were you :)We lined up near the front of Wave A on the Lenox side as well. You may have also seen us because we kinda caused a scene when the CBS Atlanta Reporter and her camera man decided to come over and interview my daughter's and I about 10 minutes before race time. Last year my husband and I ran the inaugural Harvard Pilgrim 10K road race on July 4th which finishes on the 50 yard line of GIllette Stadium home of the New England Patriots. We ran it last year because it was a race that welcomed runners and we wanted to start a new July 4th tradition as empty nesters. This year interestingly enough, a friend of mine from Conn. came to Boston to run it with us. She always ran the Peachtree Road Race until they moved from Atlanta. She talked to us about the tradition of the Peachtree and she ran it every year with her dear friend. She said she was thrilled to run the Harvard Pilgrim 10K with one of her 'new friends.' It is an incredible feeling to be out running on the Fourth of July, flags waving, hoses turned on, people cheering and for me, I celebrate the blessing of the freedom to run! p.s. You are such an inspiration!